16 nationally significant historic sites. Walk Into History® and experience more than 250 years of history on Boston’s iconic Freedom Trail®— the 2.5-mile red line leading to 16 nationally significant historic sites, each one an authentic treasure. Preserved and dedicated by the citizens of Boston in 1951, the Freedom Trail is a unique collection of museums, churches, meeting houses, burying grounds, parks, a ship, and historic markers that tell the story of the American Revolution and beyond. Today the Freedom Trail is a world-renowned, signature tourist experience attracting over 4 million people annually to visit Boston's precious 17th-, 18th- , and 19th-century sites. 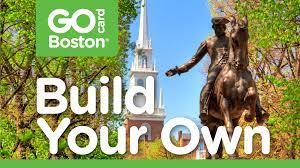 Follow the footsteps of America’s founding fathers on the Freedom Trail! The Freedom Trail Foundation's most popular tour highlights the revolutionary history that took place at 11 of the 16 official Freedom Trail historic sites. Experience and discover the women who took part in the American Revolution, and the generations of women that followed, inaugurating their own struggles for freedom and equality. March, select Saturdays-Sundays: 12:45 p.m.
All Freedom Trail tours led by 18th-century costumed guides are excellent for families, school field trips, corporate team building, incentives, and convention activities. These tours can be customized to fit your group's schedule and are available year round.